You don’t know which product to pick? Do not hesitate to contact our advisers Alliance LED by calling 09.64.00.21.59 or 09.72.35.94.89. They can give the best solution for your needs. 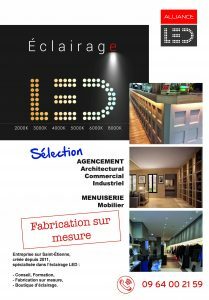 Lighting made to measure: ribbons, aluminum sections, supply, domotic, accessories, etc. Lighting shop: projectors, slabs, down lights, domotic, lamps, accessories, etc. Commercial, architectural, industrial ARRANGEMENT SELECTION and CARPENTRY. We sell our LED products from trusted brands; you can download their catalogue by clicking on the following link.